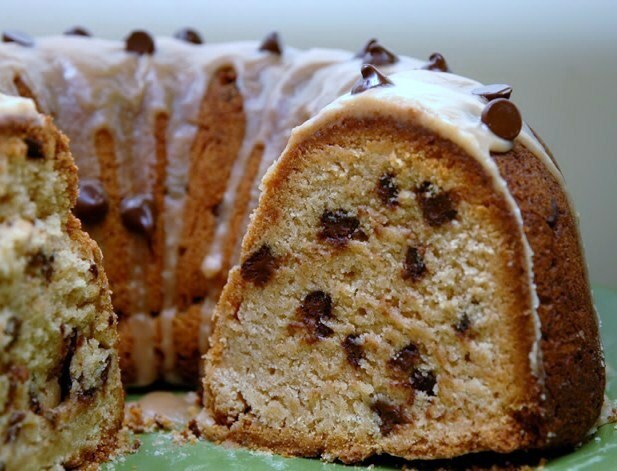 A dense but moist pound cake loaded with peanut butter and chocolate chips and drizzled with creamy peanut butter glaze. Here is an easy dessert recipe for Chocolate Chip & Peanut Butter Pound Cake with Peanut Butter Glaze. Preheat oven to 325 degrees F. Lightly grease a 10-cup tube pan with cooking spray. In a separate bowl, cream together peanut butter and butter using an electric mixer. Add sugar and beat an additional 5 minutes. Add eggs and vanilla; beat until well combined. Add flour mixture to peanut butter mixture a little at a time, beating just until incorporated. Stir in chocolate chips. Pour batter into prepared tube pan. Tap pan on the counter to remove any hidden air pockets. Bake for 1 hour and 20 minutes, checking on the cake at 1 hour to make sure it's not browning too quickly on top. If browning too quickly, just place a piece of foil loosely over the top of the pan. Cake is done when a toothpick inserted into the center comes out clean. Take out from oven and cool for 20 minutes, then flip it onto a rack or platter and let it cool completely. Meanwhile, prepare the glaze. In a medium bowl, whisk together powdered sugar, milk, peanut butter and vanilla until smooth. Drizzle glaze over the top of the cooled cake, letting it drizzle down the sides. Sprinkle chocolate chips on top. The glaze will set eventually. To quicken the setting process, just place the cake inside the refrigerator for a bit.